As specialists in Cherry Picker Hire in Brighton and across the South of England, MC Property Maintenance offers self hire and operated hire for both commercial and residential clients. Providing assistance for a range of painting and decorating services in addition to trained operators for hire, all our machines are available for long term and short term hire, suited to the needs of your specific high access project. With experience assisting clients in everything from home improvements to large scale commercial projects in factories and construction sites, MC Property Maintenance can supply the right cherry picker for the job. MC Property Maintenance provides first class cherry pickers for hire as a cost-effective, safer and less intrusive alternative to scaffolding when conducting repair or decoration works on the exterior and even the interior of any property. Cherry pickers are versatile and can be used in a multitude of locations, from churches to local shopping centres, allowing for extreme flexibility when it comes to conducting necessary renovation works for your next project. Over the years MC Property Maintenance has established a long-standing reputation for offering clients first class cherry pickers for hire in Brighton and the surrounding areas, covering a wealth of different projects. From assisting start-up businesses with decorating and painting services, to providing useful advice and property maintenance services for full-scale commercial construction projects, MC Property Maintenance is happy to help. MC Property Maintenance is officially registered with the IPAF and CPA in order to ensure complete peace of mind for all clients when hiring out our vehicles or providing our trained operatives for decorating and construction projects. Self Hire – Our self hire service is ideal for clients embarking on both short term and long term projects. The service includes a member of our team personally delivering the vehicle to your site in addition to staying and helping you familiarise yourself with the vehicle controls. In order to ensure client satisfaction, MC Property Maintenance offers the TRACCESS 170, EASYLIFT R-160, CTE-ZED 21, EASYLIFT R-180 and the EASYLIFT R-150 available for hire. Operated Hire – Our operated hire service is designed for use on long term residential and commercial projects throughout Brighton. By using an operated access platform for hire with an experienced member of the team, clients are able to receive professional advice and assistance throughout the entire duration of the project. Property Maintenance – While both our self hire and operated hire services are very popular, MC Property Maintenance also provides a range of additional property related services. When managing any residential or commercial property, it is important to ensure that it is kept in good shape, particularly for insurance purposes. Property services by MC Property Maintenance include the treating of woodwork, gutter cleaning, high-level access painting and decorating to keep your property up to shape. To find out more about the self hire and operated hire services provided in Brighton and the surrounding area, get in touch with our professional team today. We offer cherry pickers for hire on a long or short term basis to fit the needs of your next project, so simply fill out the form found below or on the sidebar to the right and we will get back to you. Alternatively, you can call us directly on 01243 262714. 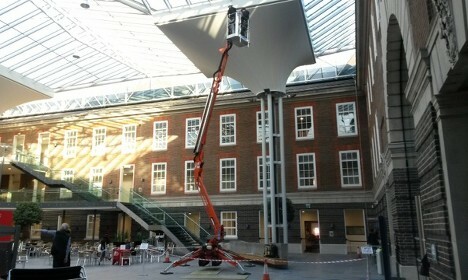 We look forward to taking your call for helpful advice on cherry picker hire in Brighton.